Miss your pets when away from home? Then check out this cool new Petcube Play. 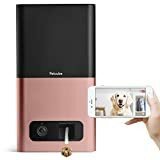 This interactive HD pet video camera lets you watch and chat with your cat or dog in realtime from anywhere in the world right on your smartphone, plus it has a built-in controllable laser dot toy too. 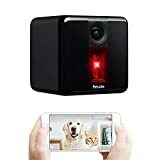 The HD 1080p resolution video camera has 138 degree wide-angle view, night vision, and a 3x digital zoom and the PetCube also features two-way audio, sound and motion notification alerts, and a laser toy with either an autoplay mode to keep your pet busy or controlled by simply swiping around on your smartphone screen. 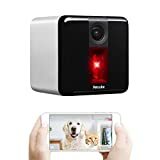 A great way to check in on your pets to maintain peace-of-mind while away, checking if they've completely destroyed your home, or just as a convenient surveillance camera as well. Petcube Play Smart Pet Camera with Interactive Laser Toy.